Amazon just became the first big cloud storage provider to offer an unlimited plan. It will cost you $59.99 per year, which is basically $5 per month, and it lets you “store an infinite number of new and existing photos, videos, files, documents, movies, and music”, according to Amazon’s press release. There’s another option too, which can come in handy if all you need is some space to store photos. 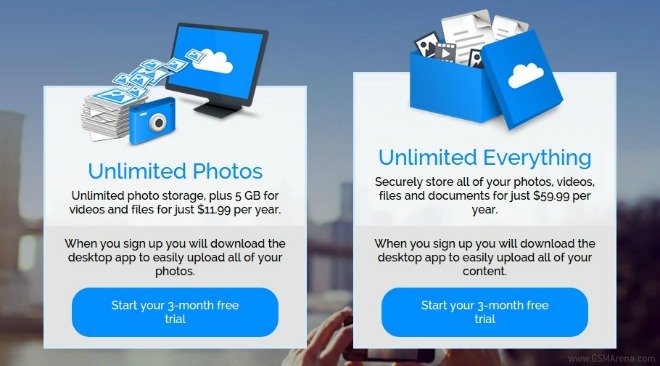 The aptly named Unlimited Photos plan gives you the ability to “store an infinite number of photos”, along with 5GB of other files, all for just $11.99 per year. That can be translated into $1 per month. Something like this was already available for subscribers to Amazon Prime and Fire device owners, but now it’s open for all. The mega-retailer is also throwing in a three month free trial for either option. If you’re already a Cloud Drive customer, you can immediately switch to the new plans. Otherwise, you can go to the service’s website to get started.